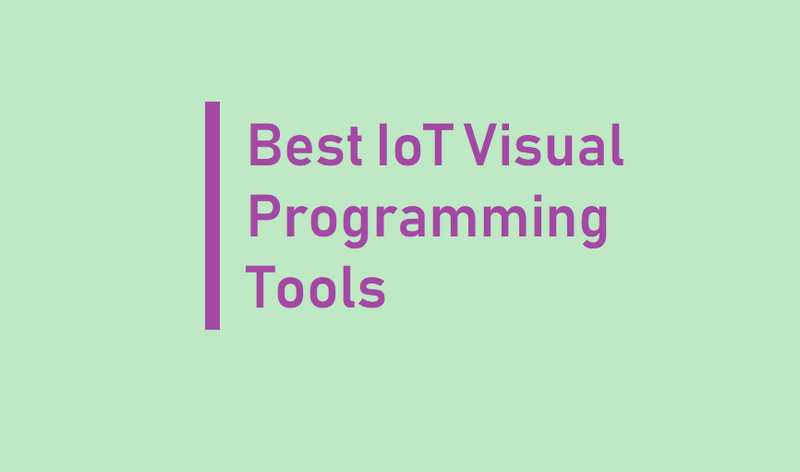 This is a list of the most important IoT visual programming tools to start developing IoT apps. Nowadays, IoT is getting more and more important and it is a fact that there is a lot of interest in this new technology. A visual programming language (VPL) is any programming language that lets users create programs by manipulating program elements graphically rather than by specifying them textually. A VPL allows programming with visual expressions, spatial arrangements of text and graphic symbols, used either as elements of syntax or secondary notation. For example, many VPLs (known as dataflow or diagrammatic programming) are based on the idea of “boxes and arrows”, where boxes or other screen objects are treated as entities, connected by arrows, lines or arcs which represent relations. Syntax: VPLs use icons/blocks, forms and diagrams trying to reduce or even to completely eliminate the potential of syntactic errors helping with the arrangement of programming primitives to create well-formed programs. Non VPLs examples would be spell check in word processors underlining or even auto correcting individual words or grammar. Semantics: VPLs may provide some mechanisms to disclose the meaning of programming primitives. This could include help functions providing documentation functions built-in to programming languages. Pragmatics: VPLs support the study of what programs mean in particular situations. This level of support allows users to put artifacts created with a VPL into a certain state in order to explore how the program would react to that state. Examples: In AgentSheets or AgentCubes users can set games or simulations into a particular state in order to see how program would react. With the Thymio programming language users can bring a robot into a certain state in order to see how it will react, i.e., which sensors will be activated. All these prototyping boards have its own programming language as C, Python, Java and similar. this is one aspect that is still a problem: the programming language. If you want to develop your IoT system, you must know at least one of these programming languages. Fortunately, during these years, several visual programming languages have been developed to help several people to start programming without knowing the programming language. These IoT visual programming tools have a different approach when it comes the time to program. Well, an IoT visual programming language has a graphical user interface where the user, using a drag-and-drop approach, move some code blocks that execute a simple piece of logic. This article wants to provide a list of IoT visual programming tools Let us begin. The order is random. Visuino is the latest innovative software from Mitov Software. It is made for hardware developers that do not have much knowledge of software development and prefer to use a visual programming language. A visual programming environment allowing you to program your Arduino boards. It currently supports the official Arduino boards, Teensy, Femto IO, ESP8266, ESP32, Controllino, Goldilocks Analogue, FreeSoC2, chipKIT, micro:bit, Maple Mini, and number of Arduino clones, however it is not restricted to their support alone and requests to support new hardware are welcome. It is made for Arduino and supports different OS as Windows, OS X and Linux. Embrio is a drag-and-drop tool that uses a different approach to program Arduino visually. Embrio is a different kind of visual programming environment which doesn’t try to mimic traditional programming, instead you create your program out of multiple “agents” which each have one job and all run at the same time in parallel. Agents attach to each other, activating and suppressing other agents similar to neurons in a brain. Agents are implemented by adding and connecting visual nodes, and you can write your own custom nodes giving you the full power of traditional coding wrapped in an easy to use graphical interface. Work with a live connection to your Arduino to get real time feedback and interaction, avoiding the cumbersome compile, upload, and test loop of traditional programming. XOD is a visual programming tool for micro-controllers. It is based on the Node concept that can represent a sensor, motors or some functional piece of code such as comparison operations, text operation and so on. Each node has an input and an output and connecting visually all the nodes we can define the IoT app logic. XOD generates native code that you can upload on Arduino compatible boards and run on it. It is an open source project and The XOD language, XOD IDE, and library sources are available on­ GitHub. This a complete platform that includes a visual programming tool that supports several prototyping boards. It helps in Industrial internet of things (IIoT). It supports several programming languages that can be used instead of the visual programming IDE. The visual IDE is built on Google Blocky. It is based on the concepts of blocks that is piece of code that perform a task. Combining blocks and defining its order, we can define the IoT app business logic. Blocks can perform simple tasks like sum two variables or more complex tasks as turning on or off a LED, set the pin status or stream data from an URL. It is a browser based environment. It supports several prototyping boards as Raspberry Pi, Intel Galileo, Intel Edison and so on. You can run secure applications using containers. Zenodys helps developers to build IoT apps easily. By using Zenodys, is possible to collect data from any sensors and visualize the values acquired easily without programming. Zenodys platform provides IDE and debugging tools for full extendability and modularity of the ecosystem. Code can be seamlessly injected into the workflows and existing projects. Using Workflow builder is possible to build complex backend solutions using visual programming tools. Finally, the UI builder helps the developer to build IoT dashboard to visualize data and information. It is a complete platform that provides several services that can be connected together using its tools and builders. Digitalisation and automation in a simple non intrusive way, without costly investmentso it helps in industry 4.0. Reactive Blocks is a visual model-driven development environment supporting formal model analysis, automated code generation, hierarchical modelling, and an extensive library of ready-to-use components for the Java platform. By combining re-usable blocks, a developer can create complex applications graphically. DG Solution Builder is a no-code application development platform featuring a graphical data-driven toolbox to rapidly build visually rich, interactive web applications and dashboards. Leveraging data from all your sources into a single visualization platform, you can analyze, monitor and control data and analytics in real-time. Utilize WYSIWYG (What You See Is What You Get) tools and visual block programming to build out how data, control requirements and logic sequences can be rationalized into meaningful information in your application. At the end of this article, you gained an overview of the most important IoT visual programming tools that you can use to develop IoT apps. This can be an easy solution for people that are more focused on the hardware part of the IoT. Anyway, at the same time, they want to develop and prototyping an IoT app easily without spending too much time. Pingback:InfluxDB | Installation | How To Use | Time Series Database ?